In Auburndale there is no King and if there was we wouldn't endorse the owner of Star Nissan. Someone tell the Courier we will not be reduced to a bunch of peasants. The Queens Courier, owned by Vicki Schneps, dubbed John Koufakis, Sr. as a ‘King’ of Queens. The event is said to recognize Queens’ most influential men in business, or those that have been terrorizing a community for a decade. 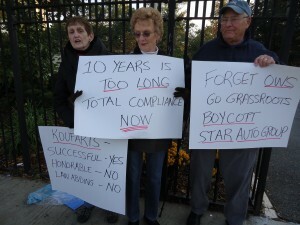 Koufakis is the owner of Star Auto Group, the same company that has been menacing the residents of Auburndale for ten years. Rhea O’ Gorman, President of the Station Road Civic Association held a protest by Terrace on the Park where the Courier news group hosted the event to honor the dubious ‘Kings’ of Queens. Who’s missing in the list? Practically everyone who makes a difference in northeast Queens. To see some of the other ‘Kings’ click here. Residents are considering a boycott of the Queens Courier. on the backs of his workers. 4:00a.m.and lasting until as late as 11:00p.m.